How do I prevent certain users from posting to a Discussion Board forum, or even viewing messages in a forum? If you do not want someone to participate (post messages) in a general site or group discussion forum, you can assign that person the role of Reader (can see posts and follow discussions but cannot post) or Blocked (cannot post or view messages). You may want to Block a user who has a past history of inappropriate posts. Step 1: In the Control Panel, in Site Tools, select Discussion Board. Step 2: Select the general (site ID) or group link. 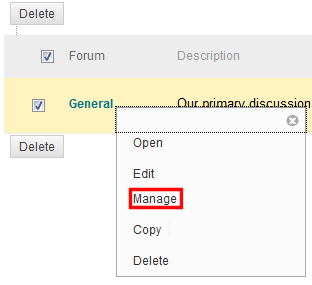 Step 3: For the forum to manage user roles, click the drop-down arrow at the end of the forum, then select Manage. Step 4: On the Manage Forum Users page, click the drop-down arrow at the end of the user's last name, then select Change to Reader or Block user from forum. You can also change the role for multiple users at once by selecting the check boxes, clicking Edit Role, and choosing the necessary role. If later you want to grant users the right to post to this forum again, choose Participant.